Comments can be utilized to identify new sales opportunities, provide better customer service, assess the impact of campaigns, prevent public relations incidents, and understand perception of products or a brand. Effective comment management can ultimately drive higher positive sentiment and conversion rates this holiday season. We take a look at five of the top benefits of actively managing comments from users on your ads, using real comments we analyzed as examples. 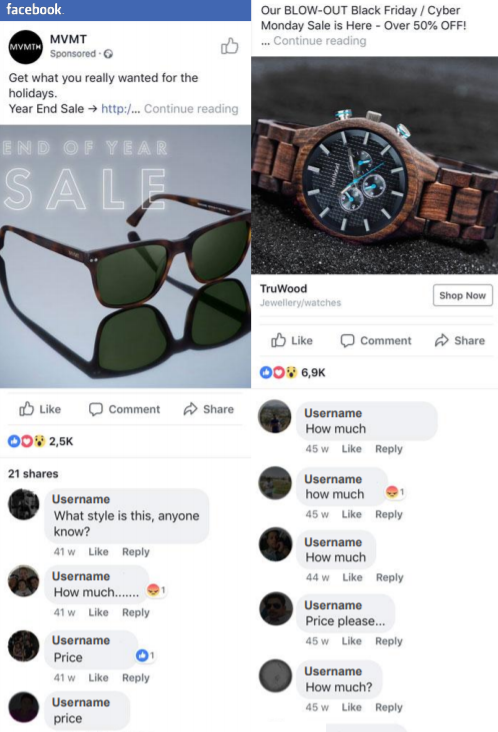 The comments section of ads from apparel, footwear, and accessory brands are often littered with comments from users wanting to know more about the products, especially during the year end when audiences are in “shopping mode”. Users who post questions about a product or how to purchase it are signaling clear purchase intent. They represent a consumer segment with high potential for conversion. TAKE ACTION: Respond promptly to customer inquiries to push them closer toward conversion and to showcase your brand’s ability to offer great customer service. Often, these issues go undetected and by the time is is discovered, thousands of dollars may have been poured into an ad that doesn’t work. TAKE ACTION: Users are usually quick to point out when something is not working on an ad - the question is, are brands listening? These types of issues can’t always be prevented, and human mistakes occur, but reacting in real-time can save significant ad spend from being wasted. On average, 5% of apparel Instagram ad comments are threats including spam, malicious links, unauthorized selling and promotion of counterfeit goods. Spam and scam, competitor promotions, highly profane comments and unauthorized sellers can harm ad performance. They make the ads look less credible and people may be hesitant to click on them. By moderating these comments and providing a great user experience, a premium online retailer was able to increase conversions by 24%. TAKE ACTION: Hide harmful comments on ads . Unauthorized selling and spam on ads may result in consumer safety issues and a damaged brand reputation. Moderating these comments in real-time enables advertisers to maintain control over their campaigns. Find out the other benefits and gain more insights by clicking the link below!